You, Too, Can Own a Colgate 26! We love our Colgate 26. We are in a marina of mostly larger boats. Our Colgate is useable when the winds are too low for others, too high for others, and on perfect days. We have a lake home, so, like the small cabin and large cockpit. We don’t need to sleep on a boat. We sail with people, or just Anne and I, or, frequently I sail by myself. The boat is fun to sail regardless of the size of the crew. There is one other Colgate 26 on Lake Muskegon.....we are frequently the only two boats out. The boat sails itself. I have no fear in this boat (Zig Zag) at all. I like going fast now! I was very impressed with the boats, as was my foredeck crew who has sailed with me for years. She found that she could tack by stepping in front of the mast or by crossing the cockpit, depending on the tactical needs of the situation. And she did it all on the foredeck: raise the spinnaker, furl the jib, gybe the pole and pull the spinnaker down. It’s unusual for a customer to tell a vendor his advertising is absolutely true. That’s what I’m telling you. 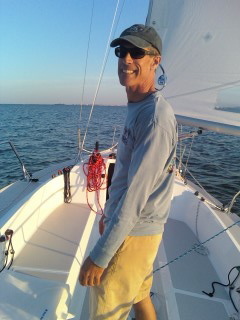 The Colgate 26 is a joy to sail! It handles well in all wind and wave conditions, and all points of sail. 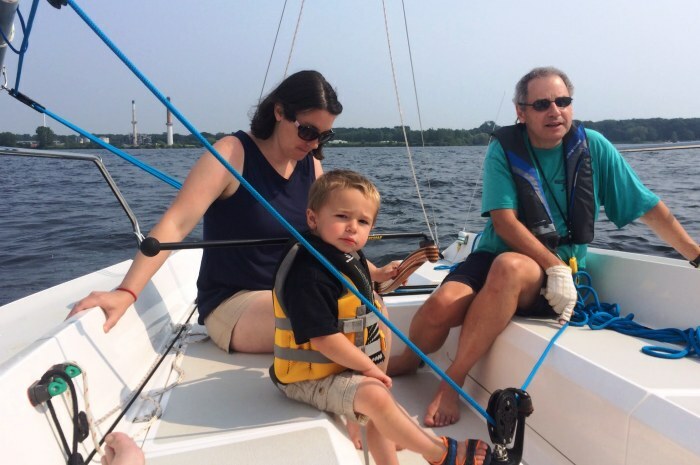 It’s a comfortable, stable, easy to sail daysailer and a fast, sophisticated racer. 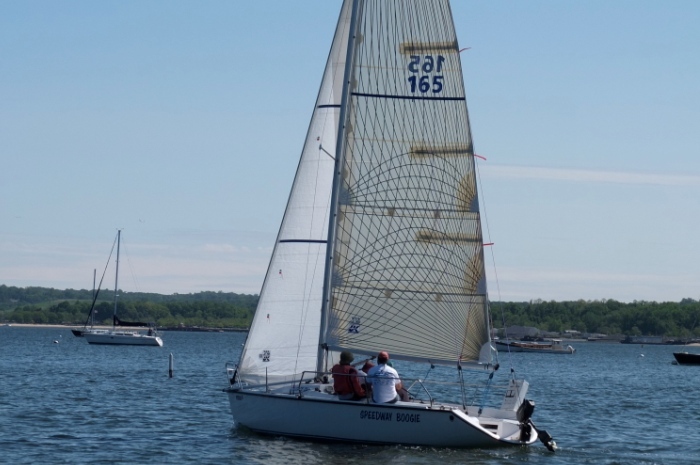 A Colgate 26, #56 owned by Jerry Ebert, took just about every PHRF cup on Lake Mendota this past summer. I must confess, he usually beats me. He often beats J80s boat-for-boat. I sometimes beat J80s boat-fro-boat. On top of all this, the Colgate 26 is a great sailing value. I have found my Colgate to be ideal on Lake Winnipesaukee in New Hampshire. My use varies from solo sails when I find that I can easily manage to sail alone, to days when the whole family and friends want to come on board and have a fun cocktail cruise. There is ample seating, below space for storage, and stability. Performance is fantastic and while I do not race the Colgate I sure enjoy being able to tune her up and catch or leave anyone that happens to be heading in a similar direction. I also have fun with novice sailors given the ease at which one can teach family members and friends to sail. Conditions vary a great deal from day to day on the lake and even from hour to hour. There are times when things are quiet and light wind performance is needed and times when the winds and waves pick up quickly and stability is very important. The Colgate handles it all with ease. Have you ever tried to do a 360 penalty turn while moving along at a good clip? The boat (Nancy Anne) will spin like a top! You feel like a kid in an icy parking lot with your dad’s car. The Colgate 26 is one of the very few items that I have ever purchases in my life that has exceeded my expectations. 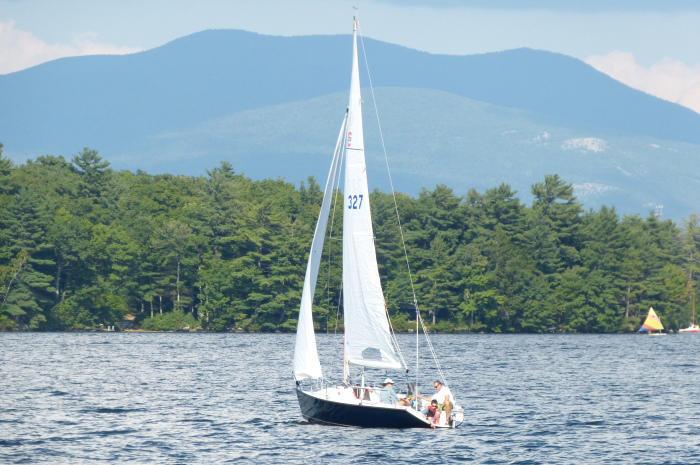 Far from the normal “buyer’s remorse” or slight let down that has inevitably followed the initial euphoria of getting most new “toys,” I have been very pleasantly surprised by the joy that sailing the Colgate 26 has delivered every time I take it out. I don’t know whether it is simply how solidly it is built, how darned fast it is even when only sailing with the main, how I can easily single-hand sail it or take out 6 friends in the roomy cockpit, or the responsive handling and sleek design. It is probably all of these traits taken together that add up to a very smartly designed, well-constructed fun sailboat. This photo was taken during the PWYC Charity Cup race in 35 knots of steady wind and big waves. We got the boat up to 10.3 knots on a broad reach prior to the chute going up. My Colgate 26 (Naked Dance) took 2nd in the PHRF Spinnaker Division! 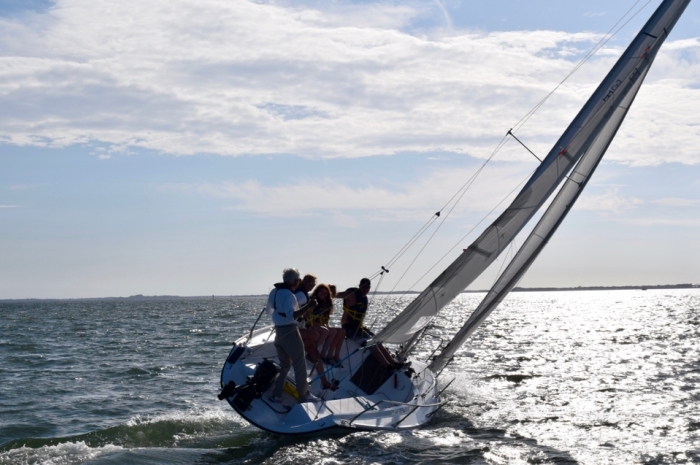 The C26 is a unique boat – it is a great platform for teaching sailing while still providing solid racing and daysailing performance. As such, it attracts a lot of new sailors or racers. 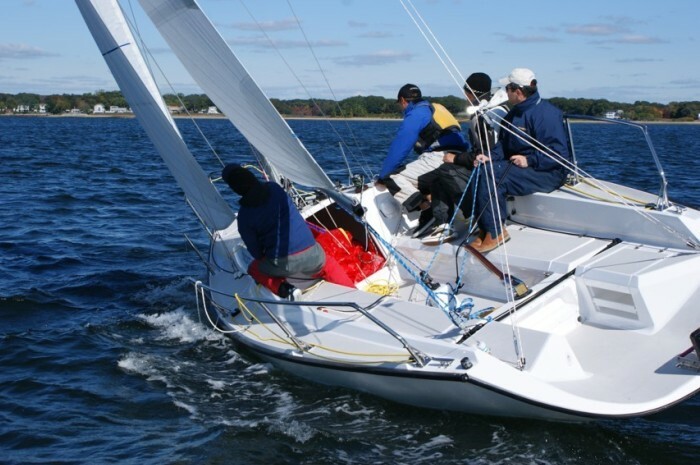 The Colgate 26 is our first choice keelboat for our beginners as well as intermediate sailors in both recreational and educational settings. 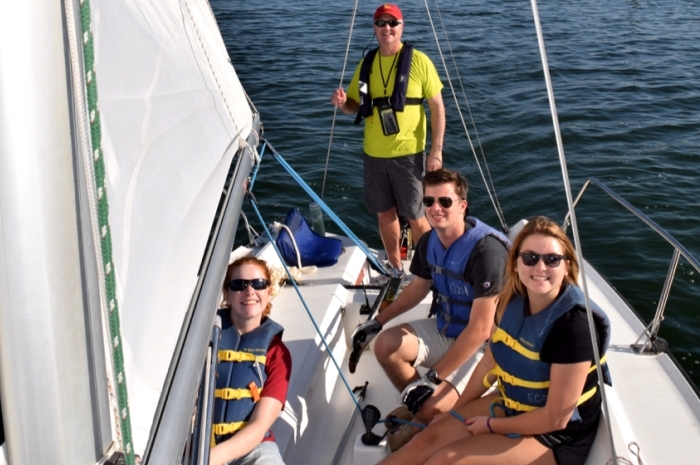 The flexibility of the large cockpit, responsive handling and a dedicated instructor space allow our program to not only teach sailing skills but more importantly: introduce non-sailors to our sport in a comfortable and nonthreatening way. Recently saw a J24 – a beautiful boat recently refurbished. We were both single-handling; sailed up the lake together, chatting from boat to boat. About every half mile I had to do a 360 so the J could catch up! I have a 5-year-old grandniece who loves the boat. She takes the helm occasionally. She loves to jump off the stern and be gently pulled along in the water on a line. She loves to play the “look, dad, no hands” while she runs around the deck. The Colgate 26 has exceeded my expectations, as I was looking for an affordable daysailer that I could competitively race. What stands out after sailing the boat for the past several seasons is the large user-friendly cockpit. The boat has all the lines to shape the sails to make the Colgate go fast and lines are easily accessible, which makes it easy to sail when I am just out sailing my Colgate 26 (Speedway Boogie) with a few friends who are not sailors. We love our C26 (Three Deep Breaths), and we've been sailing around Shelter Island for the last few years. I really do love my boat. It has very little weather helm and is great in the big seas that you can get on Lake Michigan. I feel very safe knowing that it has positive flotation and will not sink. We predominantly day sail, and the cockpit is great. You can really spread out. I owned hull #77, a 2000 build, from 2003 to 2016. 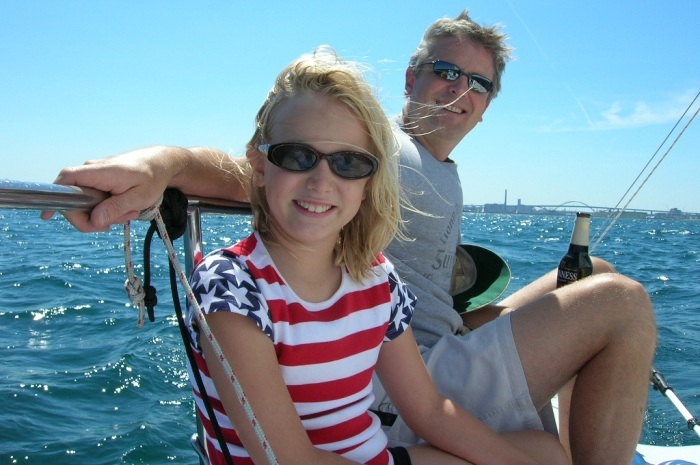 Sea Monkey was the perfect platform to learn and expand my racing skills and to get my kids sailing with me. I just can't express how much joy the boat brought me, my family and my racing crew of Monkey Men. She is a highly competitive PHRF racer - we won a lot of club races - at the same time being perfectly balanced and forgiving. She is simple, while still providing every control needed to get everything out of the sail plan and rig. I bought a somewhat larger PHRF racer two and half years ago, a boat I'm enjoying a lot, but nothing's as easy as it was on the Monkey. I will always love the Colgate 26. The Colgate 26 is a very good, all purpose boat that can be used for training, cruising, racing, night sailing or camping on the island. 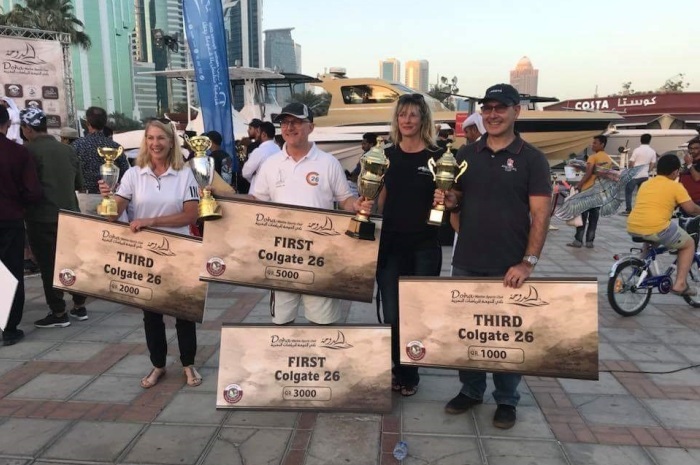 It is most impressive that the Colgate 26 participates in many national and international regattas and can tolerate heavy weather. I've sailed a number of different day sailors over my career teaching sailing. I find the Colgate 26 to be admirably set up for adult instruction. The boat is easily driven in light air and convenient to sail as the winds picks up. The full range of sail controls and the boat's responsiveness make it easy to show students how much control they can have over the power and handling of the boat. The instructor cockpit aft provides an excellent view of the action on the boat and a safe and comfortable place for the instructor to work from. We're using the shoal draft version of the boat at the College, and I don't see any practical difference between it and the standard boat. The Colgate team has thought of almost everything. Here is my son, Peter Colby, the Sales Director at North Sails, Newport, RI and some of his North colleagues. 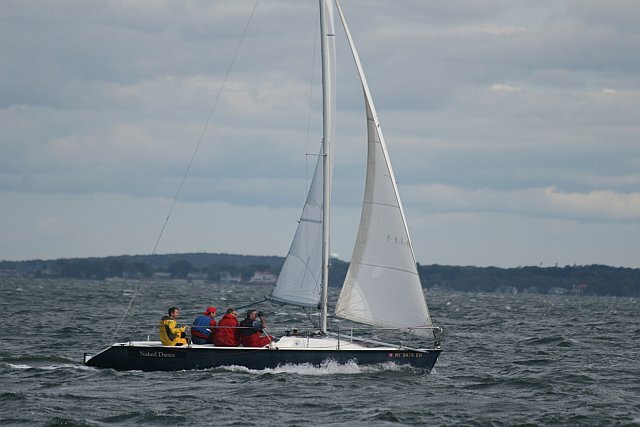 They were doing some speed testing on our Colgate 26 after tuning the rig on a hilly October day on Narragansett Bay. The Colgate 26 is easy to rig and lets you get underway in minutes, saving valuable practice time. 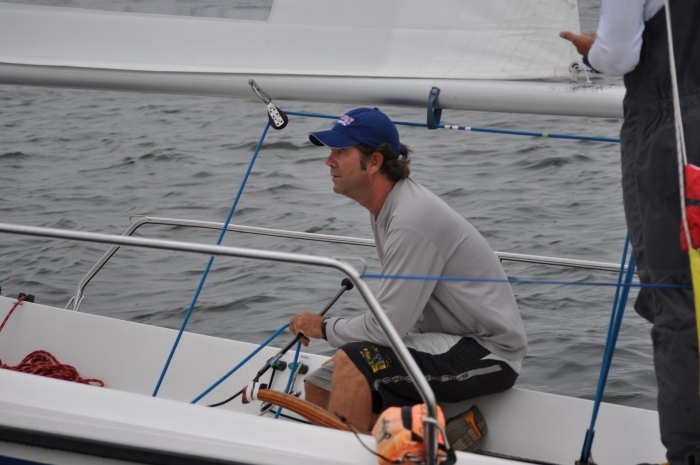 New York Maritime sailors particularly enjoy having the opportunity to not only improve their boat handling and boat speed, but also hone their tactics while match racing during practice. 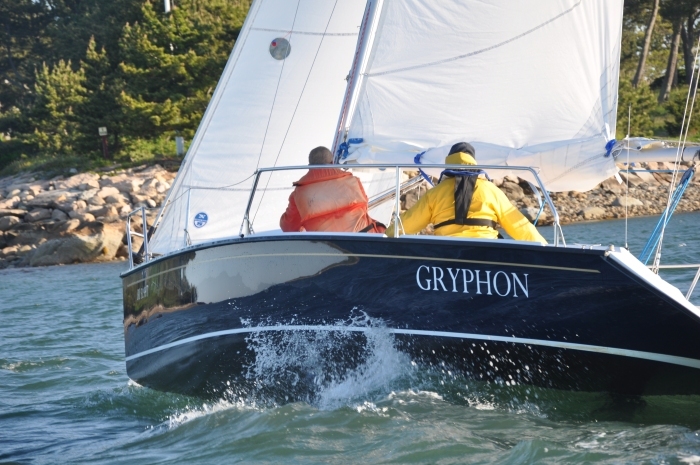 This is one of my favorite shots of our Colgate 26, Gryphon. It was taken a few yeas ago while sailing through Woods Hole. I cannot tell you how many boats I looked at prior to my decision. There is truly nothing in the marketplace today which compares to the C26. I found what I was looking for in this boat. And I get the added bonus of a stable, good looking vessel at a price that screams VALUE! Since a child, I’ve raced, cruised, daysailed and done deliveries. Even been convinced that power boats are cool. When cruising and daysailing, I’m very often single-handed. My bride, Hannah, is a farm girl. She “likes to be sailed.” In my world, watching sunsets is just as important as winning races. IMHO: The only thing that makes a GREAT SAILBOAT is sailing ability. That is defined as: “does it all, in all conditions” which means: Single-handed; overloaded with non-sailing friends on an afternoon frolic; great in light air with or without a racing crew and racing sails; easy to handle when it’s blowing 35 TWS; when reefed, or double reefed, sails well and comfortably without frightening the farm girl or our friends; coming home the 50 miles from Cape Cod and the wind howls; easy to get really good speed; rewarding when trimmed very carefully; has great “feel” at the helm; has balance up wind and down; friends friendly. By these standards the Colgate 26 is a GREAT SAILBOAT! Every Sonar and small J owner who has sailed mine has remarked on how great the helm feels. But it doesn’t stop there. While it has a very nice overnight cabin, it doesn’t add things pretending like it’s a week long cruising machine. I sleep on my boat at regular intervals. I’m 6’ and 200 pounds. The quarter berths are very large. On Sunday mornings, before the wind arrives, the cockpit is a great place to daydream or nap. Every costly piece of gear is from the best brands. The lines are an exception, but I’m a rigging nut and knew I would be making changes anyway. Having said that, I sailed and raced the boat for 3 months without touching a thing. Note from Steve Colgate: Ted Squire was one of our first owners. He sold his boat and now lives in Ireland. Since his boat was delivered, we have upgraded the running rigging.